Coat tender chicken breast with golden, crisp panko breadcrumbs for a dinner to satisfy the whole table. 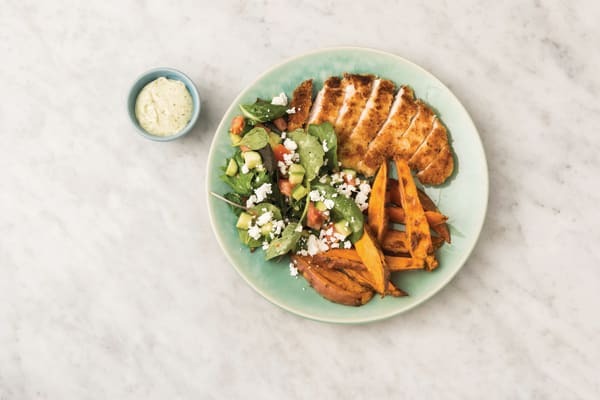 With a generous salad and tangy mustard dressing, plus sweet potato wedges and a creamy pesto sauce for dipping, this meal is the best of the best! Preheat the oven to 240°C/220°C fan-forced. 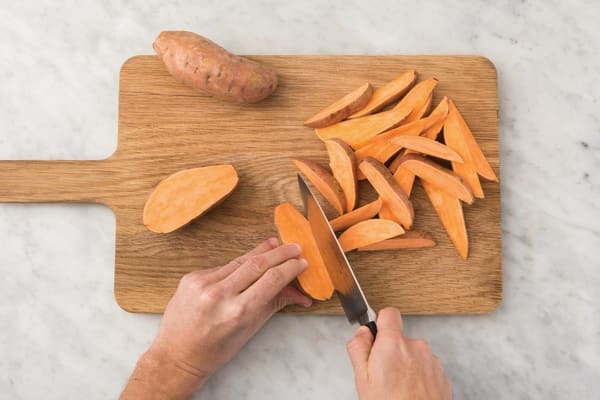 Cut the sweet potato (unpeeled) into 1cm thick wedges. Transfer to an oven tray lined with baking paper. Drizzle with olive oil, season with salt and pepper and toss to coat. Roast until tender, 25-30 minutes. TIP: Cut the sweet potato to the correct size so it cooks in the allocated time. While the potatoes are roasting, zest the lemon to get a pinch. Roughly chop the tomato and cucumber. 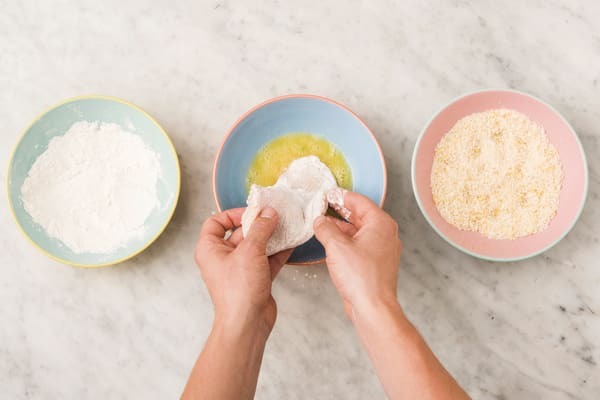 Place the chicken breasts between two sheets of plastic wrap or baking paper. 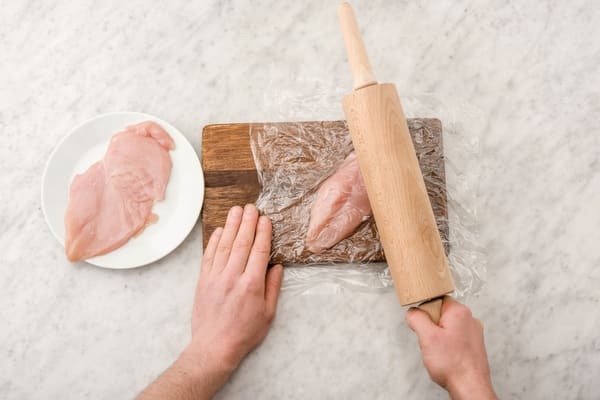 Pound the chicken with a meat mallet or rolling pin until it is an even thickness, about 1cm thick. Heat a large frying pan over a medium-high heat with enough olive oil to coat the base of the pan. 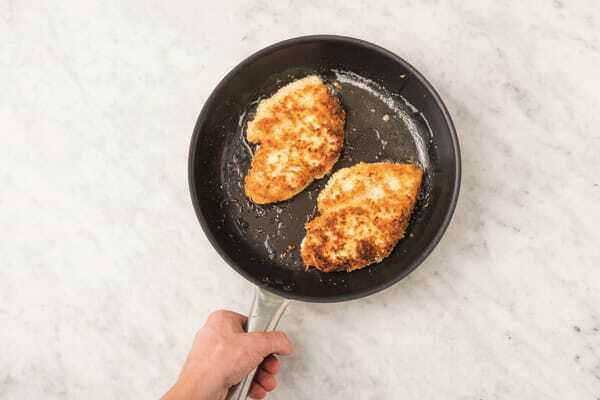 When the oil is hot, add the crumbed chicken breast and cook until golden on the outside and cooked through, 2-4 minutes on each side. Transfer to a plate lined with paper towel to drain. TIP: Add extra oil if needed so the chicken doesn't stick. Thickly slice the lemony crumbed chicken. 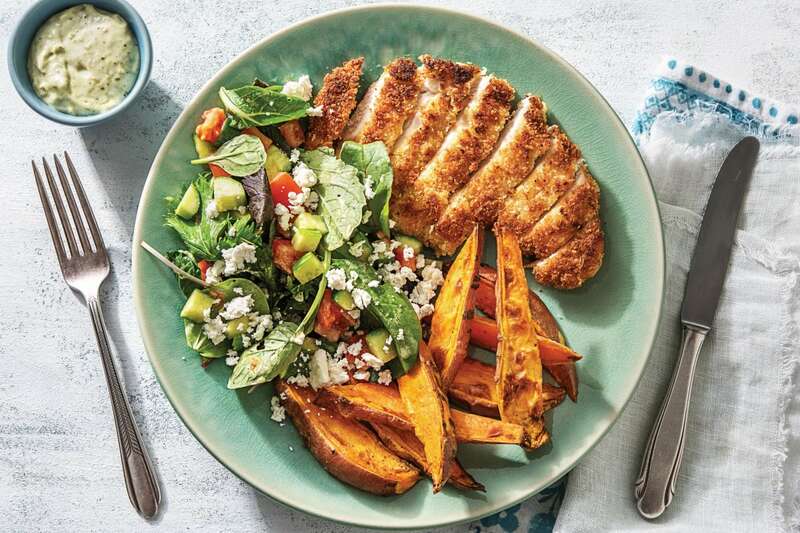 Divide the chicken, salad and sweet potato wedges between plates. Crumble the fetta over the salad. 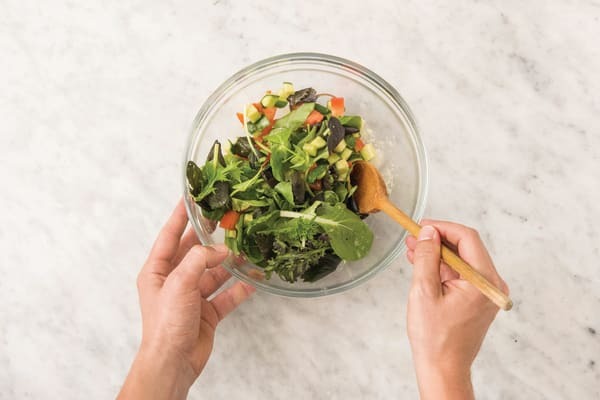 Serve with the creamy pesto dressing.